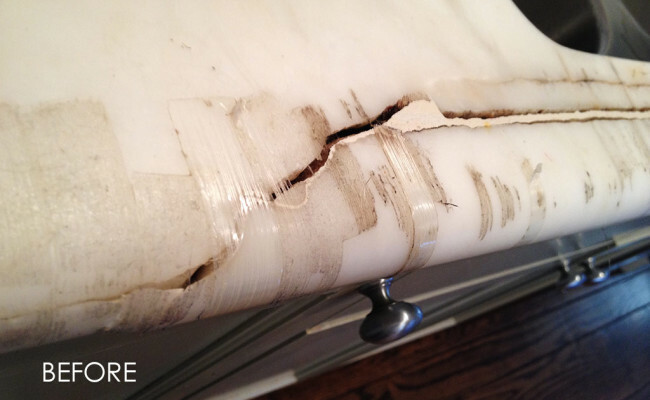 A white Carrera marble kitchen countertop had a large crack caused by water damage, as you can see in the BEFORE image. 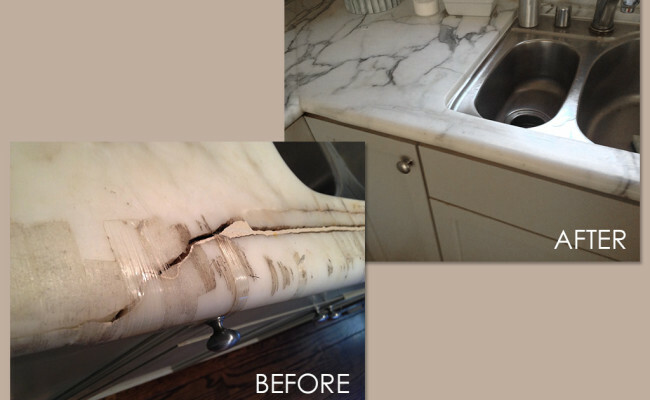 The seal around the sink disintegrated and water seeped under the marble slab. 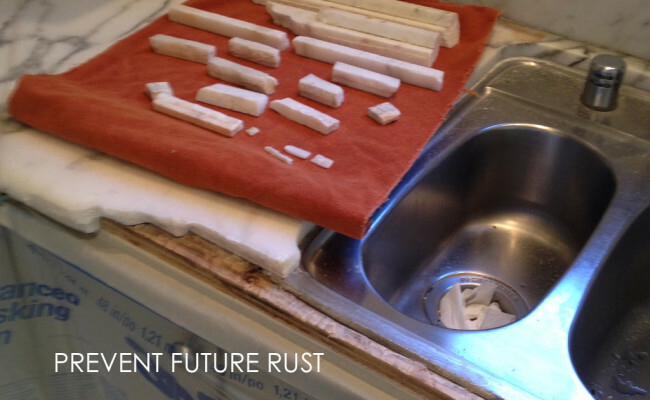 A metal support bar under the front section of the opening for the sink, furnished at the time of fabrication to prevent the slab from cracking during delivery and installation, became rusted with constant exposure to moisture. 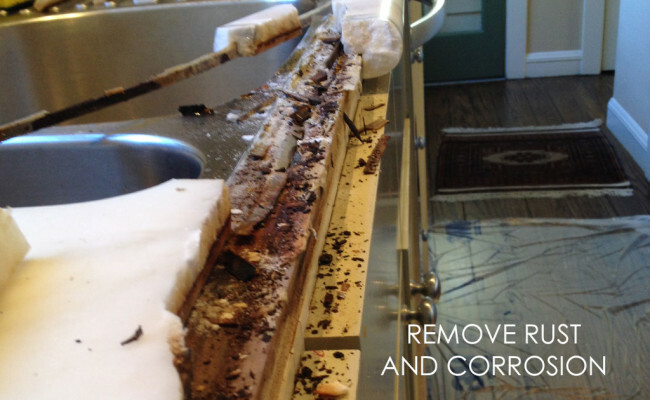 The first step in repairing this countertop was to cut away the damaged area, and remove rust and corrosion. 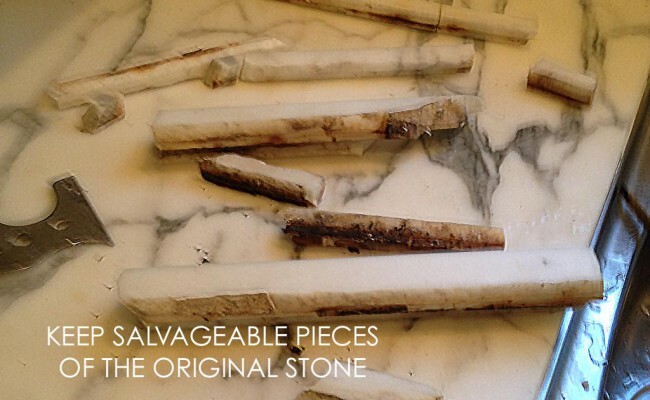 We were careful to keep salvageable pieces of the marble, because the more original stone we were able to retain, the less fabricated stone we would need later. We detached the metal support bar and used clear epoxy (notice how it appears as a dark glaze in the fifth image) to seal and water proof the wood base, preventing future rust and corrosion. With the substrate prepared, we were ready to reassemble the stone, carefully aligning each piece to create a perfectly level surface, because misaligned pieces would cause dips or waves in the finish. Any missing sections and pieces were formed with colored epoxy. This marble, being gray and white, was relatively simple to match. Other more colorful types of stone can take many hours to blend and match. After ample drying time, we ground the surface of the countertop flat, power-honed it with 400 grit diamond pads, and then sealed it to inhibit staining. Notice the dramatic difference between the gaping crack in the BEFORE image and the smooth, uniform surface in the AFTER image. 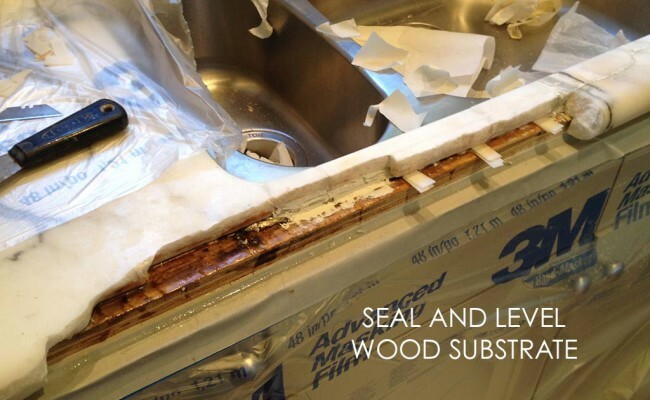 We were able to save the homeowners thousands of dollars by repairing the countertop instead of having it replaced. To learn more about marble cleaning, repair, and restoration, visit our Natural Stone Services Page. 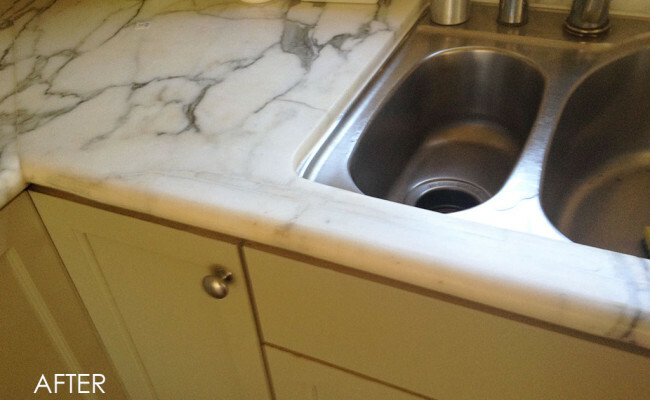 For marble countertop repair, marble countertop polishing, or other natural stone restoration services, contact us online or call (925) 625-9625. We service Lafayette, CA, as well as the Alameda and Contra Costa County areas.